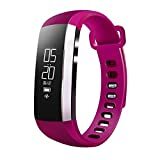 MULTI-FUNCTIONS: Fitness Tracker, Pedometer, Calories, Sleep Monitor, Heart Rate Monitor, Blood pressure, Blood oxygen, Sports target remind, Sync date and time, SMS Notifications, Remote Camera, Finding Phone Anti-lost, Alarm Clock, APP Reminder, Sedentary Reminder. All this functions need fitness watch synchronize with your smartphone by “Wearfit” APP. COMPATIBILITY: Android 4.4 or above;iOS 8.0 and above, phone hardware support Wireless Bluetooth 4.0. Need open phone’s bluetooth (bluetooth connection remains stable). LONG BATTERY LIFE, Charge the 85mAh battery for about 1.5 hour with the USB connection and 5-7 days standby time. IPX67 WATER RESISTANT: Waterproof Sturdy Materials, not afraid of washing hands, doing housework, walking under rain. Getting caught in the rain will not damage your fitness tracker watch. Light water contact no problem. Never worry about damage because of water issues. Ultra-slim deign with 0.86 inch OLED Screen Display. LIVING A HEALTHY LIFE: Activity Tracker, Wherever can recording your movement state clearly, be contrast and reference to the data, morning wake up vibration alarm, sleep monitoring, sedentary reminder, calorie burnt count, step count, with this monitor you can hardly give up your health. Men Women Boys Girls Ladies can all use this Smart Bracelet Wristband. ONE SUPPORT ALL: Heart rate & Activities tracking, real-time blood monitoring, intelligent exercises recognition, auto-sleep tracking, caller name dispaly, schedule management, no disturb mode, etc. WHAT IS IN THE PACKAGE: Wrist Band x 1, USB Charger Cable x1, User Manual x 1. Be sure to keep the body relax when blood pressure monitor.